ATC Insurance is an Australian owned business offering innovative, tailored and competitive insurance products that cover a wide range of risks. Incorporated in 2006, ATC Insurance is a coverholder at Lloyd’s of London, a global specialist in the insurance and reinsurance market. Departments of ATC Insurance have worked with Esendex services since early 2012. Prior to discovering the possibilities of SMS, ATC Insurance had reached their clients through direct mail to remind them of due payments. The Trade Pack department found that cancellation rates were higher than necessary, this was due to the fact that people had not been receiving the reminders. Even worse, the department had no way of knowing whether certain deliveries had failed. Other departments of ATC Insurance, who were already using SMS services, described Esendex as “fantastic” and “smoothly run.” It was because of these strong recommendations that the Trade Pack department made the switch in late 2013. The move to SMS messaging has allowed a swift and traceable means of reminding customers about payments. The results were quickly visible by a 14% increase in customer retention. Andreanna Murphy, a representative of ATC Insurance, believes the boost in customer retention is mostly attributable to the new means of communication. "We highly recommend the web SMS service (Echo) as it is so quick and easy to use and is a fantastic tool to retain clients." Customers are now successfully being reminded about payments in a matter of seconds. This enables them to make timely payments to ensure they’re covered by ATC Insurance. SMS messages have proved to be the most direct means of contacting customers and have also been extremely cost effective for ATC Insurance. “It paid for itself,” said Ms. Murphy. “We highly recommend the web SMS service (Echo) as it is so quick and easy to use and is a fantastic tool to retain clients,” she said. 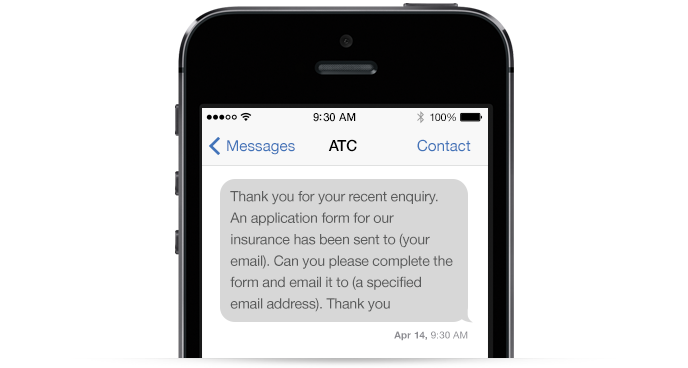 ATC Insurance is currently looking for more ways to expand their use of SMS. They are excited to utilise the potential it has exhibited for growth and maintenance of customers in the future.